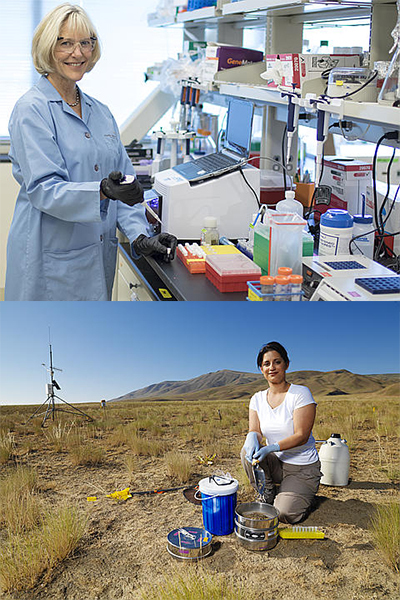 Vanessa L. Bailey and Janet K. Jansson, prominent microbiologists at Pacific Northwest National Laboratory (PNNL), were quoted extensively this week in "Crucial role of belowground biodiversity," a John Carey feature story in the July 12 issue of the prestigious journal Proceedings of the National Academy of Sciences (PNAS). It was Bailey's description of soil science as a "black box" of mysteries to researchers that was the story's leitmotif. This recurrent image illustrates the huge task ahead for soil scientists, many of whom are doing pioneering soil microbiome work at PNNL. Bailey, a PNNL Senior Scientist, was quoted as saying that since getting her Ph.D. 17 years ago, "we know more about what's in the black box and what those microorganisms are doing." Gigabytes of new data are emerging from today's studies, now that soil science has moved from the laboratory to the natural world and now that its critical significance to human health and climate change has emerged. Jannson, Chief Scientist of Biological Sciences at PNNL and director of the Microbiomes in Transition (MinT) initiative, was quoted regarding the many surprises that true soil biodiversity brought to science once genomics and other molecular tools were brought into play. Before, she said, "we had no way of testing what was there. People didn't anticipate there was such a concentration of unknown organisms in soil." Some of the startling facts of soil biodiversity, according to the story, include that more than 100 billion organisms can live in a handful of soil. And that just one gram of soil, about the weight of a paper clip, can contain enough hyphae (fungal filaments) to stretch out a mile. Then there is the emerging proof that in surprising ways soils are vital to understanding climate change. Soils, after all, contain an immense percentage of the world's carbon and, when perturbed, could release it into the atmosphere. In the story, climate related research by both Jansson and Bailey got strong mentions. As the feature pointed out, "much more soil carbon is now poised to churn out into the air as the permafrost melts." As an example of how new genetic and molecular tools are being applied to arctic [cq] soils, the author pointed to Jansson's 2015 paper on the potential climate consequences of warming permafrost. "There is a rapid conversion of this community into one that can release greenhouse gases," she said, referring to bacteria in the subzero soils she studied. Bailey called soil "the major buffer system for environmental changes" in a statement that earned her a pullout quote. The PNAS feature then gave several column inches of real estate to the 2016 Rattlesnake Mountain soil-switching study she did with PNNL research scientist Ben Bond-Lamberty and others. Even after 17 years, the paper showed, soil samples subject to the switched locations displayed an apparent lack of climate-change resilience to alterations in moisture and temperature, as measured by bacterial activity. "That was really weird," said Bailey, "and very sobering in the face of planetary change." In one sentence: Bailey and Jansson, prominent microbiologists at PNNL, were quoted extensively this week in the July 12 issue of the prestigious journal Proceedings of the National Academy of Sciences (PNAS).